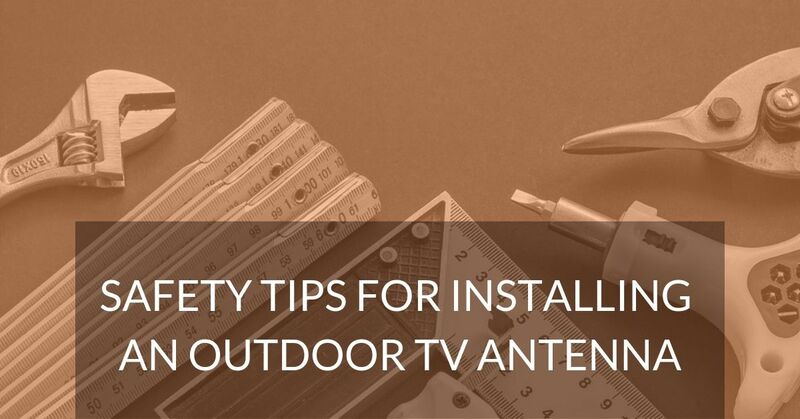 You’ve probably heard it’s good practice to ground an outdoor TV antenna to minimize the effects of static electricity buildup. I’m here to tell you this is correct advice and you should ground your antenna directly after installing it. 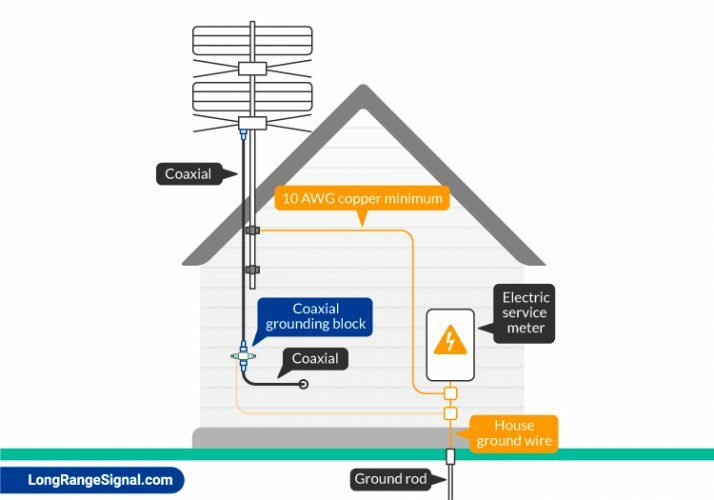 Grounding an antenna will involve some extra steps — you’ll run copper wire from both the antenna mast and coaxial cable to your house ground (more on that below). 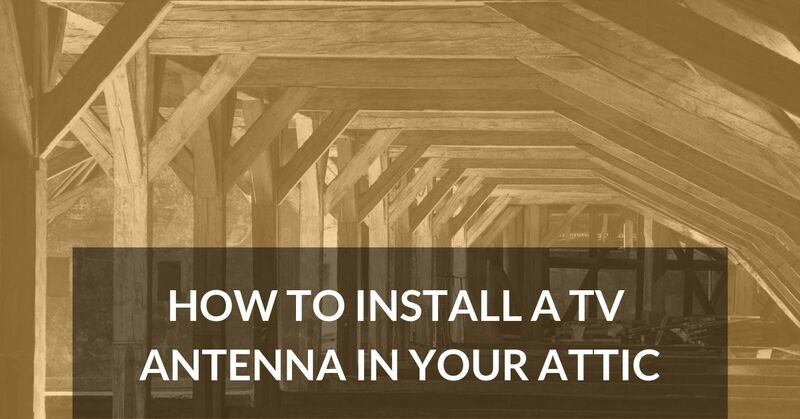 Despite this extra effort, it’s a great way to protect the investment you already made in purchasing and setting up your antenna. Once you’ve properly grounded it, you can rest assured the accumulation of static electrical charge and effects of indirect lightning strikes nearby will be properly drawn off and shunted to ground. This article describes basic concepts of grounding. If your situation is somewhat complicated — for example, your house ground is attached to a water line (as is sometimes found in older homes) — or if you simply have questions, it’s advisable to contact an electrician who can give you professional advice. 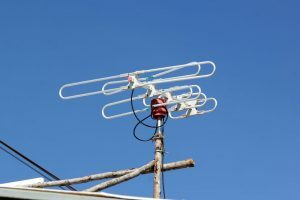 Why Ground a TV Antenna? 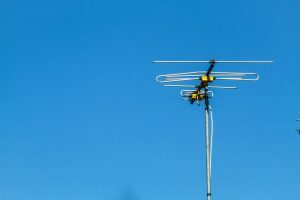 Does Grounding an Antenna Improve Reception? Should You Ground an Indoor Antenna? Power surges flowing along an ungrounded TV cable can cause damage that is at times subtle, manifesting itself by the picture simply no longer appearing on your TV. Or the damage can be spectacular, as in the case of a direct lightning hit on your antenna. If this happens, the consequences are impossible to predict but grounding offers a conduit that helps minimize damage. Even (indirect) lightning strikes happening nearby can pose a threat to house electrical systems that aren’t grounded. 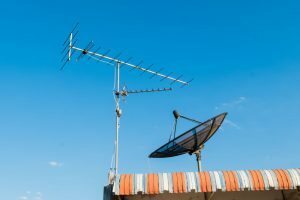 There are differing opinions about whether grounding an antenna boosts TV reception. 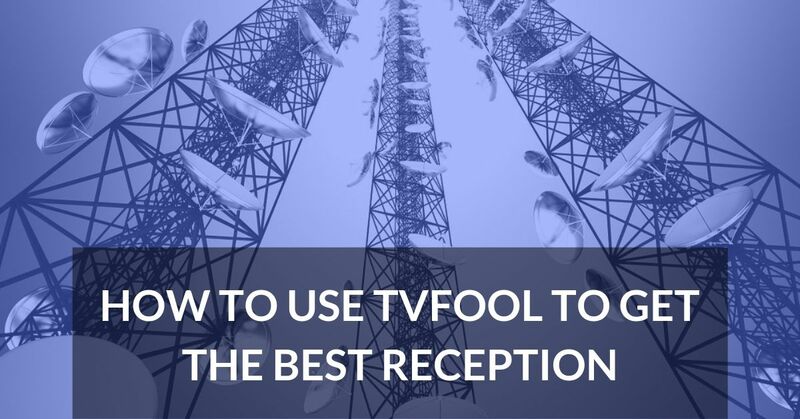 Some customers report improved reception, while most don’t. As grounding can reduce noise travelling down the coaxial, those who report better reception may in fact be experiencing the reduced interference that grounding offers. You should keep in mind however the main reason for grounding: to divert excess static electricity towards the ground. You’re also doing it for safety reasons. Incidental benefits are of course fantastic but shouldn’t be expected. The National Electric Code (NEC) Article 810 is a standard for grounding procedures and compliance. For overall safety in the home, it mandates the principle of “single-point grounding,” which means all grounds should be connected to the Power Service Grounding Electrode System (often found conveniently near your electric service meter panel). Single-point grounding is essential because you want all surges to flow towards one, predictable point on its way to ground. The earth is actually a poor conductor, and multiple grounding points offering differing levels of potential that may lead to stray currents. The NEC is not only used by electricians; many jurisdictions adopt the code outright as their legal regulations for how electrical systems should be set up. 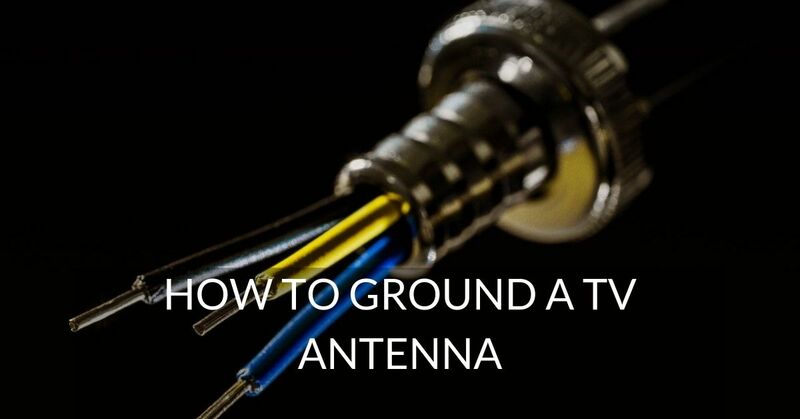 Before starting, let’s examine what’s being done, and what you’ll need to ground your antenna. Both these wires terminate, or are joined together at a place referred to as the “Power Service Grounding Electrode System” located at the bottom right. This is just a fancy word meaning a metal ground rod that’s driven into the earth to divert electrical surges. In some homes there are several of these underground rods bonded together by a metal wire, but most homes will use just one grounding rod. You can usually find a single house ground wire emerging from around your electric service meter panel and going directly into the earth. It’s a thick metal wire (usually copper) that’s attached to the underground metal rod, providing the single-point grounding recommended by the NEC. You should take the time to quickly inspect your house ground wire, noting it’s location and checking for corrosion. Acidic soils are known to slowly eat away at this wire, effectively cutting it — which is why some house ground wires are made from other materials besides copper. 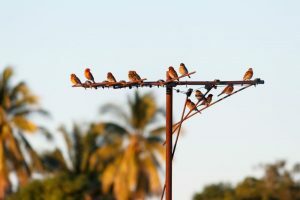 You’ll need two copper wires — both should have a thickness of at least #10 American Wire Gauge (AWG) but less thick than your house ground wire (which itself might be anywhere from #6 to #2) — to ground the mast and antenna coaxial cable respectively. For this I recommend Solid Copper Grounding Wire from THE CIMPLE CO (pictured below). It’s #10 AWG made of solid copper and has ideal grounding properties. To bond a grounding wire to the antenna mast you can use either a ground strap or pipe clamp. An alternative is a pipe clamp, which is heavy duty and made of steel with serrated adapters. An example is the 90628 Ground Pipe Clamp by Morris Products. Pipe clamps are intended for bonding grounding rods but some people also use them as mast clamps. It may also be possible to attach the grounding wire to a bolt on the antenna mount (without buying a clamp). If the area where the grounding wire makes contact with the mast is painted or coated, you should scrape this off so the wire makes direct contact with the mount. Next, you’ll need a grounding block. It’s a little device used solely to ground the antenna coaxial cable. 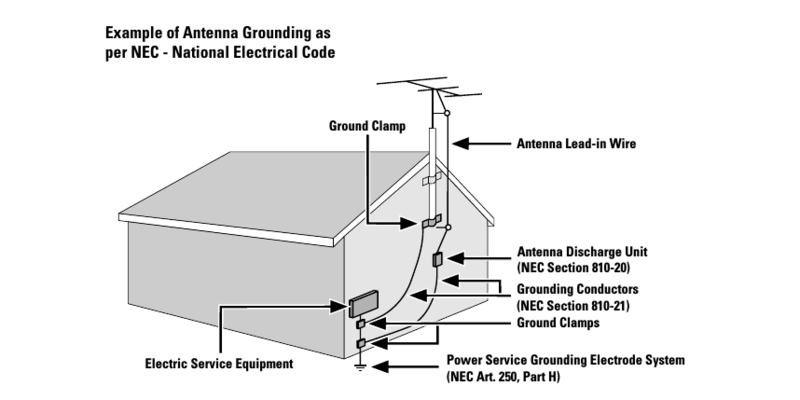 You can find this properly indicated in the NEC diagram above (the NEC also refers to the grounding block as an “antenna discharge unit”). Most people end up buying a standard grounding block, which resembles the funny-looking clamp below. It’s typically located near where the coaxial cable enters the home, and allows static charges to dissipate from the coaxial cable without disrupting the signal. To install this, you’ll attach the antenna coaxial cable to one side of this block, then attach a separate coaxial to the other side and run this to your TV. You can see that the block has two holes with green screws acting as clamps — you’ll attach a grounding wire to one of these and run it down to your house ground wire (described below). This particular device is THE CIMPLE CO 3 GHz Ground Block. The reference to 3GHz is the maximum signal frequency this block allows through (indicating it can also be used for satellite television). 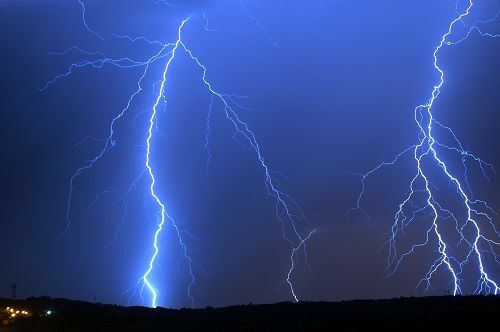 If you believe your home is at high risk of direct lightning strikes, you may consider getting a lightning arrester rather than a standard grounding block. A lightning arrester is a more sophisticated type of block as it’s filled with a gas that gets ionized by high voltage spikes and faciliates the surge’s path to the ground. An example of such a device is this GIMILINK Coaxial Lightning Arrester. You’ll run both the mast and coax cable grounding wires down to the house ground wire — as indicated in the NEC diagram — and attach them each to the house ground wire using ground clamps (note in the diagram that both grounding wires are separately clamped to the house ground wire). Most people use a split bolt such as the ones pictured below for this purpose. It may be unsafe if you need to detach the house ground wire in order to attach these clamps, however. In this case you can use what’s called an Intersystem Bonding Termination Bar (ITSB). This allows you to attach multiple grounding wires without needing to detach the house ground wire. The GBB5P Bronze Grounding Bridge by Arlington Industries is an example of an ITSB, which allows you to attach up to four separate grounding wires to the house ground wire safely. When installing the coax grounding block you’ll be using at least two segments of coax cable (both to and from the block) so be sure there’s enough to go around. The best type is RG6 (rather than RG59) that’s tri- or quad-shielded to reduce potential interference, such as MediaBridge Tri-Shielded RG6 Coaxial Cable. If you’re working with segments of coaxial cable you may consider getting a toolkit like the GoodQbuy Coax Compression Connector kit for crimping and fitting compression connectors. 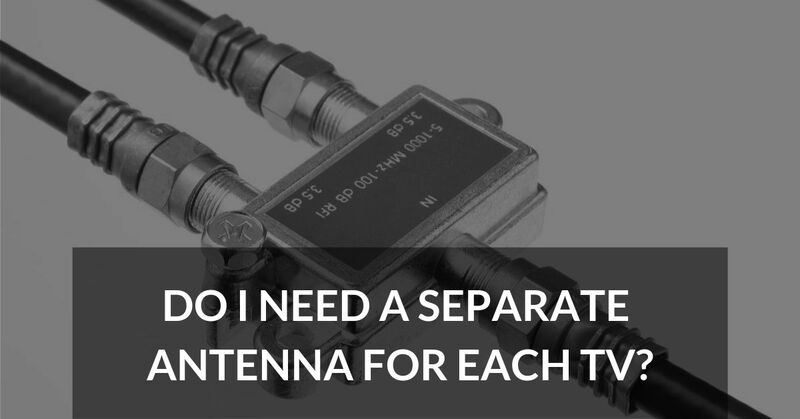 As mentioned previously, you’ll need to ground two parts of your antenna: the mast and the coaxial cable. Personally I’d do the more complex task first — this gives me a better idea of the requirements and makes the last step easier. In this case the more complicated task is grounding the coax with a grounding block (also known as “signal grounding”). 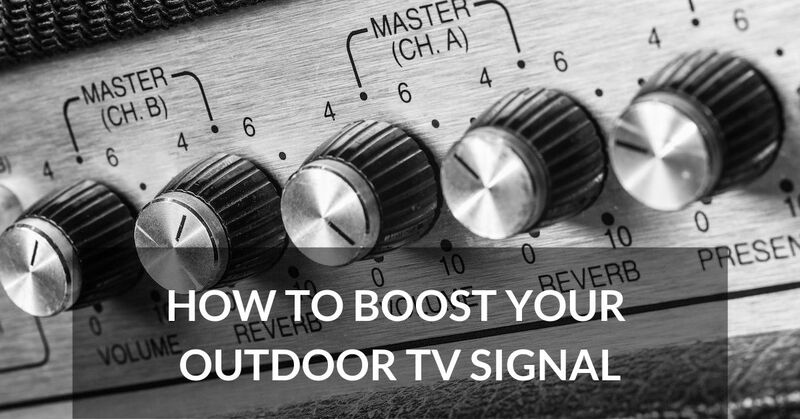 Besides shunting off excess static electrical charge, grounding the coax has the added benefit of reducing or eliminating radio frequency noise from connected AC-operated equipment (like your TV) that potentially interferes with signal reception. 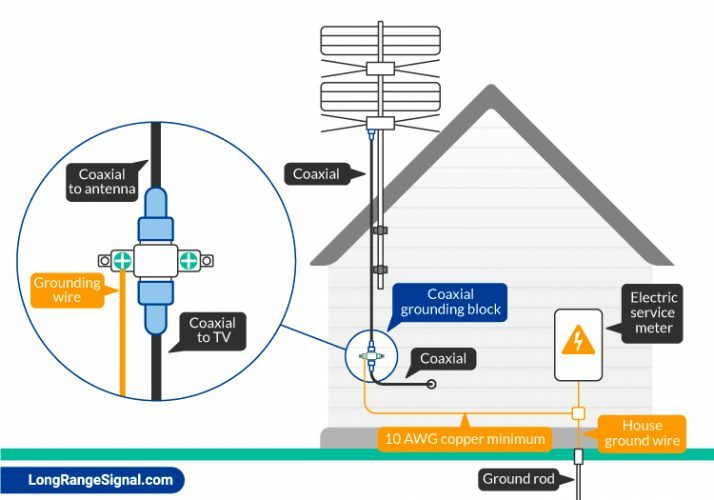 Follow the steps below to ground your coaxial cable. Identify where the antenna coaxial enters the house. You can attach the block to the exterior of your house, so ideally this spot should also be sheltered from rain. Most grounding blocks come with screws allowing you to install them directly on the exterior of your home. As with all steps with running coaxial cable along walls, you should take care that it’s of the proper length, possibly shortening it using tools and capping it with a coaxial cable compression connector — pictured below. You can weatherproof the connections between the cables and block using STUF Dialectric Weatherproofing Grease. It won’t affect the flow of signal and will keep moisture out. Make sure to loop the coaxial cable before it enters the building to prevent rain from dripping inside your house. Also avoid 90 degree turns in coaxial cables. If you can’t avoid this, try using 90 Degree F Type Adapters for Coax Cable. Ensure the coaxials are properly connected to block and that your TV is receiving signal before proceeding to the next step. Take the copper grounding wire and attach one end to the block. Next, run it to the house ground wire and attach it there using a clamp, split bolt, or ITSB. As you run the wire from the coax block, make sure it takes the shortest path possible and avoids sharp turns (try to introduce curves rather than bends in the wire if you must). This will help ensure that surges stay on path and don’t deviate in other directions on their way to ground. If you’re using a mast clamp, make sure it’s attached securely and won’t easily slip off. If you’re attaching the grounding wire directly to the antenna mount via a bolt, make sure the wire makes direct contact with the mount (scrape off paint or coating if necessary). Now run the mast grounding wire to the house ground wire and attach it. If you’re using a bolt or simple clamp, attach the wire in a separate place than the coax grounding wire. As with the coax grounding wire, try to avoid sharp bends and use the shortest route possible to the house ground wire. 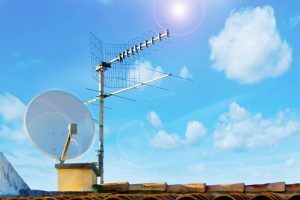 Antennas that are set up indoors (especially in attics) are well protected from thunderstorms and lightning, so why ground these? 1. If you need to add an LTE or bandpass filter to your antenna (to get rid of unwanted interference from cell phone signals), grounding the coaxial will make the filter more effective. Otherwise, unwanted radio frequency noise may go around the filter and enter the coaxial cable. 2. Grounding the coaxial cable will protect you from possible electric shock. 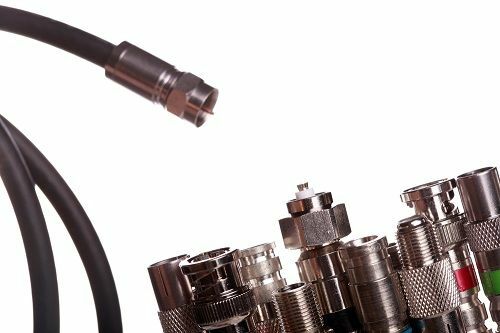 Ultimately, the coaxial is connected to your television or converter box. All AC-operated equipment has leakage, even when they’re working correctly. But if there’s a failure in your equipment, grounding the coaxial should safely divert any excess current to ground. Keep in mind that if your TV or converter box uses a 3-prong power cord, then it’s probably grounded and there’s less concern about an electrical hazard (and no need to separately ground the cable with a grounding block). On the other hand, if it uses a 2-prong power cord, then unsafe leakage current may be an issue. Always remember that the goal of grounding is safety. As such, you can’t do it haphazardly. If you’re not confident or skilled enough for this task, you can always hire a licensed electrician or an antenna professional to get it done. It’s also important to follow local laws governing electrical systems to ensure compliance. Some recommended products may use affiliate links. LongRangeSignal.com is a participant in the Amazon Services LLC Associates Program, an affiliate advertising program designed to provide a means for sites to earn advertising fees by advertising and linking to Amazon.com. Amazon and the Amazon logo are trademarks of Amazon.com, Inc or its affiliates. Copyright © 2019 Long Range Signal | All Rights Reserved.